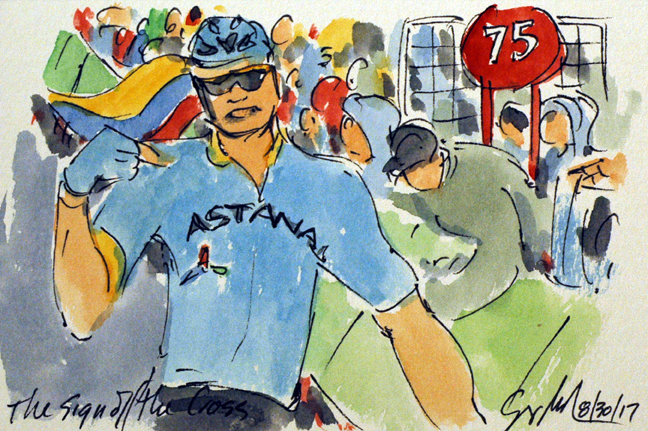 Jumping free of all of the GC contenders was the Colombian climber on Team Astana, Miguel Angel Lopez. As he crossed the finish line he made the sign of the cross before throwing his arms in the air in a victory salute. 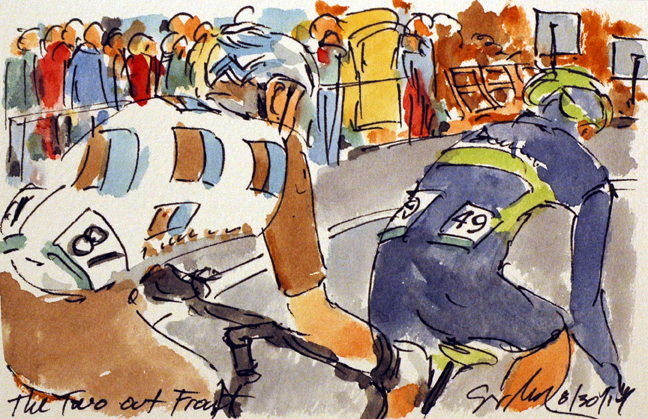 It is common for riders to say a quick prayer and cross themselves at the start (and often at the finish) of any race. 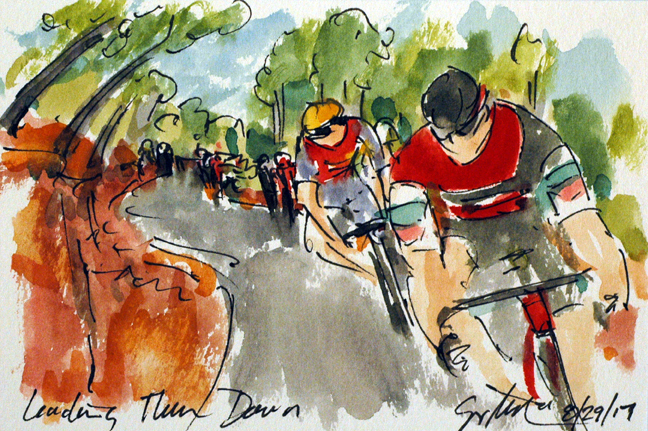 So much can go wrong in a day of bike racing - or even just getting out on a spin on the bike. This is something I know all to well having been hit ten times by cars while out on my bike. 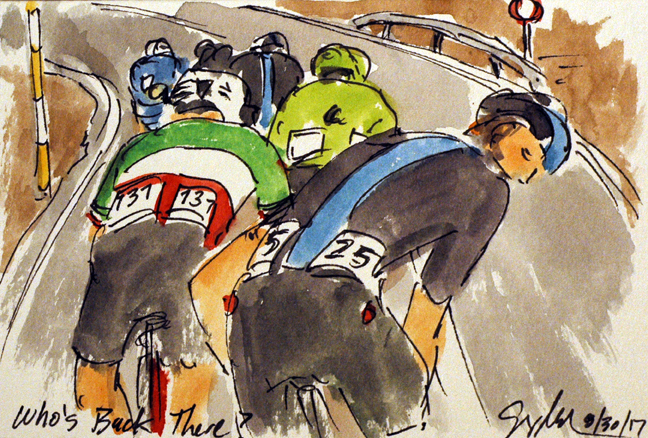 But like the pro peloton, the risk is worth the reward in, oh, so many ways! Vincenzo Nibali (Bahrain Merida) was the only one able to open up a gap on the remnants of the peloton. While the road leveled out near the summit the winds were creating a strong crosswind as evidenced by the Spanish flag flapping behind the former winner of the Vuelta (and the other two Grand Tours). 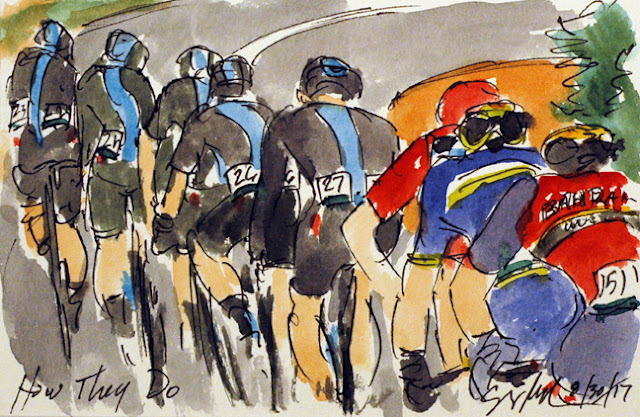 Others were hoping to put Froome on the ropes in the crosswinds and to break the strangle hold of Team Sky. 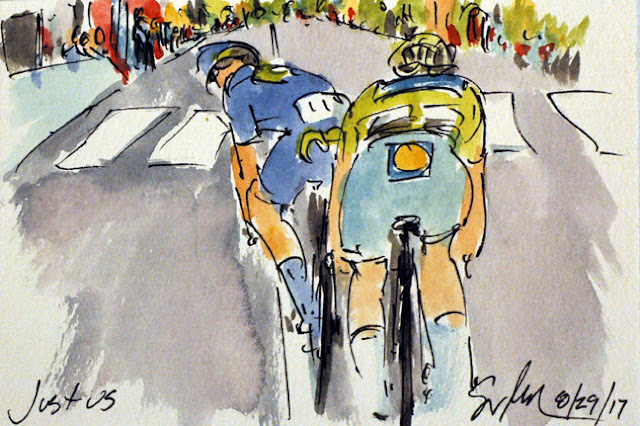 This attack did give Nibali second place over all but left him over a minute behind the Red Jersey of Froome. 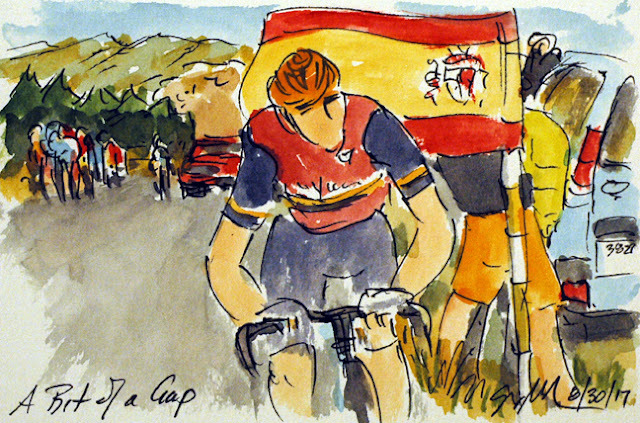 Vuelta, Stage 11: Who's Back There? Having done what he could on the front for Chris Froome (Sky) Gianni Moscon (Sky) joined up with one of the groups further down the final climb up to the observatory and the end of the stage. He was with a group that contained the Italian National Champion, Fabio Aru (Astana) and Michael Woods (Cannondale-Drapac) both of whom were losing more time to Froome. On the front of this the third group is David de la Cruz (Quickstep) who had an ill-timed puncture and was riding hard to limit his loses. Having been in the break all day, Romain Bardet (Ag2r La Mondiale) had to be disappointed to be joined by an attacking Simon Yates (Orica-Scott). Yates had just bridged across from the peloton on the way up the penultimate climb of the day and had the fresher legs. Yet the duo dropped the rest of the early break on the technical descent into the valley in hopes of getting to the summit and the finishing line ahead of the Sky lead peloton. Both riders had lost time in earlier stages, so there was a chance that Sky would be unconcerned with this attack and not chase. The title uses a bit of urban slang to say this is what Team Sky does to the rest of the peloton. With their leader, Chris Froome in the Red Jersey of race leader, they just drive the pace at the front of the peloton with dominate numbers of teammates. As the ascend the Alto de Velefigue it is Salvatore Puccio riding on the front followed in turn by David Lopez, Mikel Nieve, Wout Poels and then Froome himself. On the back of the Sky train is Jack Haig (Orica-Scott) and Vincenzo Nibali (Bahrain Merida). Behind them are the rest of the GC hopefuls all wondering how they can derail the power of Froome's team. Up until today, the weather story of the Vuelta has been how hot it was (not that heat is big news for the summer in Spain). But today the peloton, and this breakaway, faced bitter cold and trenching rains. A large group got away on the flats before the two steep climbs that marked the end of the day. 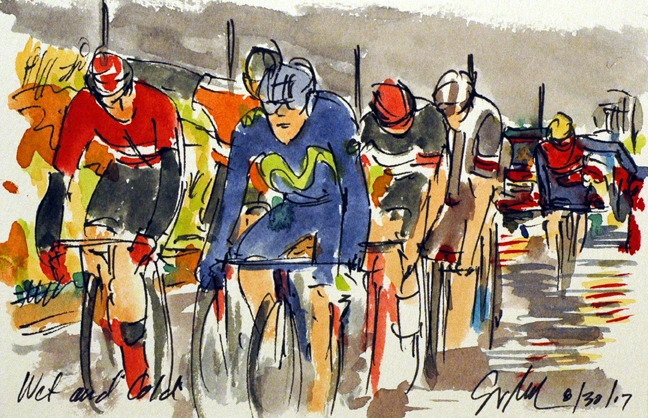 Some of those that you can see in this painting are, Sander Armee (Lotto Soudal), Antonio Pedrero (Movistar), Matej Mohoric (UAE-Emirates), Lennard Hofstede (Sun Web) and in the back ground passing of his soaked raincoat, Giovanni Visconte (Bahrain-Merida). It was going to be a hard day in the cold that many would have trouble adjusting to after so many hot, hot days. As even Jose Joaquim Rojas (Movistar) knew going into the finale, he had no answer for the sprinting prowess of Matteo Trentin (Quickstep). Trentin easily claimed his second stage victory in this year's Vuelta and the fourth for his team. Again it was quite unexpected to see two sprinters come to the line alone on a stage that had a catagory one climb within the final kilometers of the stage. Chapeau, Matteo! Oddly, it was the two sprinters from the early break that out climbed the rest of the break (and the peloton) to find themselves all alone. With just two kilometers left to race, Jose Joaquim Rojas (Movistar) peeks over his shoulder to make sure there are no surprises from those chasing behind. Unfortunately for Rojas, it is the Matteo Trentin (Quickstep) in the green sprinter's jersey who is on his wheel. Clearly it will be these two who vie for stage honors and the odds are against the Spaniard. In the catagory of "Nothing Ventured, Nothing Gained" Vincenzo Nibali (Bahrain Merida) attacked the peloton near the summit of the final climb in hopes of using his descending skill to gain time on the Red Jersey of Chris Froome (Sky), unfortunately, others were able to stay with the flying Italian, so the plan just didn't work. 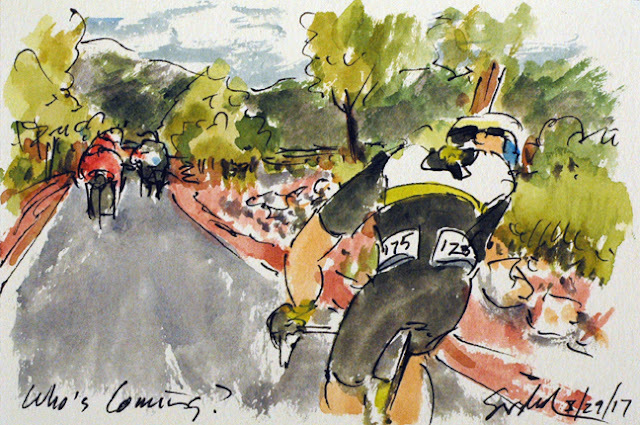 As the reduced group hit the bottom of the climb, it was Nicolas Roche (BMC) who lead them through the final turns. Roche was able to surprise the regrouped peloton that had declared a truce and gain almost half a minute on all of his general classification rivals. Sneaky! Vuelta, Stage 10: Who's Coming? After a rather long break, I'm back. 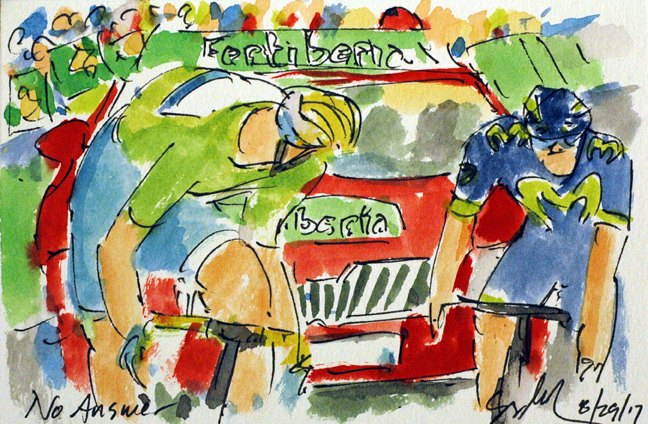 I watched the Tour and the first week of the Vuelta, but I have just today picked up my pen and brush to paint racing again. I needed the break. But I did miss the thrill of painting the racing as well as being more connected to the world wide cycling community. So with the first rest day of the Vuelta completed and my rather longer rest months done, it is time to paint (and race) again. Jacques Janse Van Rensburg (Dimension Data) attacked on the final climb of the stage. He is looking back over his shoulder in hopes of being joined by some of the others in the early, rather large, break of the day. One should always be careful of what you wish for.